Late last week, Republican Arizona Gov. Jan Brewer signed a measure banning abortion providers such as Planned Parenthood from receiving state funding. The law, known as the Whole Woman's Health Funding Priority Act, discontinues funding for family planning and other health services offered by Planned Parenthood clinics and other organizations that provide abortions, according to a statement (pdf) released by her office. "This is a commonsense law that tightens existing state regulations and closes loopholes in order to ensure that taxpayer dollars are not used to fund abortions, whether directly or indirectly," Brewer said in the statement. "By signing this measure into law, I stand with the majority of Americans who oppose the use of taxpayer funds for abortion." Brewer signed the measure while speaking at a reception for Susan B. Anthony List, a political action committee devoted to helping elect anti-abortion officials to public office, including Mitt Romney, the presumptive Republican presidential nominee. Cynde Cerf, a spokeswoman for Planned Parenthood Arizona, told The Root that the agency was bracing for the measure, which would cut off funding for up to 4,000 poor women. The group used state funding to provide a variety of services to these women, including breast- and cervical-cancer screenings, birth control and annual exams. "We're waiting to see what is going to happen and how the law will affect our clients," said Cerf, whose agency has a diversity of funding streams besides the state and sees an estimated 44,000 first-time clients each year. "We're looking at what legal remedies we can pursue." Since GOP lawmakers lost a bruising federal congressional battle to defund Planned Parenthood last year, they have led a charge on the state level with help from groups like SBA List to defund Planned Parenthood. SBA List, according to its news release, has provided state groups and legislators with model legislation, expert testimony and grassroots support. Planned Parenthood has been the target of most of the attacks because critics say it is responsible for overpopulating neighborhoods, especially those in which the majority of residents are black, with abortion clinics. But the Guttmacher Institute released statistics (pdf) last year showing that less than 10 percent of abortion clinics are located in predominantly African-American neighborhoods. Indeed, more than half of women of reproductive age live in states hostile to abortion rights, Planned Parenthood officials say. So far North Carolina, Texas and Kansas have enacted legislation similar to Arizona's Whole Woman's Health Funding Priority Act. 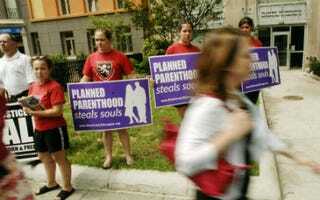 New Jersey, Indiana and Wisconsin have blocked public funding for abortion providers. Some states have gone further, pushing measures that give rights to embryos through so-called personhood amendments or simply by banning abortions outright, so to speak, by making it so difficult for providers to operate that they are forced to close their doors. Last month Mississippi Gov. Phil Bryant signed a measure that requires physicians who perform abortions to be board-certified ob-gyns and have admitting privileges at an area hospital, CNN reports. But there's a catch. Only one of the physicians at Mississippi's sole provider has admitting privileges at a local hospital, and the measure could effectively close down that state's only provider of abortion services, the Associated Press reports. Women could jeopardize their health by having to travel long distances to seek care, Planned Parenthood officials say. In addition to the abortion law signed by Bryant, the Mississippi House of Representatives passed what Planned Parenthood officials are calling a backdoor personhood amendment that could outlaw birth control, infertility treatments and all abortions. The measure, Planned Parenthood argues, ignores the will of Mississippi voters, who just last fall soundly defeated a so-called personhood amendment. "Make no mistake; this law is based on a political agenda, not medical necessity," Cecile Richards, president of Planned Parenthood Federation of America, said in a prepared statement. "In yet another shortsighted attempt to ban abortion in Mississippi, Gov. Bryant and lawmakers are putting their ideology above the health and safety of Mississippi women. This law is bad policy and endangers women's health." That's not how Bryant sees things. "I believe that all human life is precious, and as governor, I will work to ensure that the lives of the born and unborn are protected in Mississippi," he said in a prepared statement. "This bill requires all physicians associated with an abortion clinic in Mississippi to be board-certified or eligible in obstetrics and gynecology. To further protect patient safety in the event of a complication during the procedure, this bill also requires the physician to have staff and admitting privileges at a local hospital." Last month in Tennessee, the Senate approved legislation that extends that state's murder and assault laws to the earliest stage of pregnancy. In Alabama, House lawmakers are considering a measure would require health centers that provide abortions to meet standards enforced by the Alabama State Board of Health and the Alabama Department of Public Health, as well as the health and safety standards required for all medical offices, said Leola Reis, vice president of external affairs for Planned Parenthood Southeast in Atlanta. "A lot of people have couched what's going on as a war on women," Reis said. "We're being targeted because we provide abortions, but we are about the full range of health care. What they don't understand is that making abortion illegal doesn't make it go away. Part of the reason it became legal was because it was a public health problem. What we don't see anymore is maternal mortality related to abortion services. We don't want to see those numbers rise again."